Location: Botanical Gardens, Hervey Bay Australia. 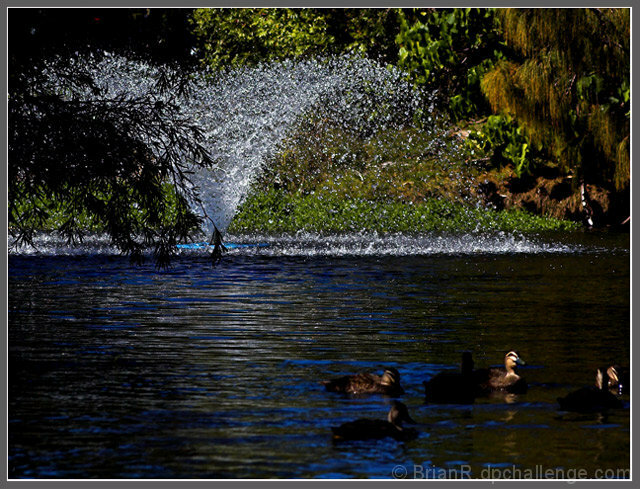 This was meant to have birds in action, but they didn’t perform, liked the fountain and set out to stop the motion of the water, and create an image with atmosphere. This is a little to over processed for me. This looks familiar. Like I've seen this same location in another challenge entry. No matter. Just a curiosity. ;^) This image has good rich color to it. Contrast is good, maybe even a smidgen on the heavy side - which is unusual. The water is nice and dark. The action of the water fountain has been stopped just fine for meeting the 'Stopped Motion' theme of this challenge. I'm glad you've included the ducks in this scene. Separates it from other similar water shots I've seen thus far. Not that that is going to help your score a lot...the subject is still too common for this challenge. Like it or not, viewers are going to get tired of similar shots. I'm not saying it's right - it's just life. ;^) Overall, nice job in capturing this image. Good luck in the challenge. you've stopped the water, yes, but the overall image is just a bit too dark. i looks like a scene that has potential, but, as it's rendered here, it doesn't really do much for me. I like the droplets frozen in mid air and the colors here. The area with the ducks is too dark though. Proudly hosted by Sargasso Networks. Current Server Time: 04/25/2019 11:45:45 AM EDT.